Question: How does a Muslim Palestinian go from being a near-suicide bomber to becoming an outspoken Zionist (and in San Francisco, of all places)? The transition began after Shoebat married a Christian woman, and in trying to prove to her that Islam was the true path, he began reading the Bible to prove to her how wrong she was. "In 1993 I started looking into my enemy's book, the Tanach and I came to the conclusion that the Jewish people are the most peaceful people on earth." 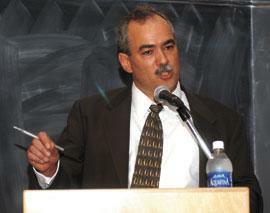 May 18, 2006 update: Walid Shoebat has become a figure of some controversy. For an exchange on this topic, see three comments below, starting with the accusation by Moshe Katz, "Walid Shoebat – hero or snakeoil salesman?" and then replies by Walid Shoebat and myself, plus a number of readers. I wrote that "Walid Shoebat took the time to visit me in my office today and to show me proofs that his life story is a true one. I accept that it is.". Mr. Shoebat showed me a number of documents in several languages - official papers, newspaper clippings, and the like. I read them when he visited me but did not keep copies. He admits that he although can document most of his life he cannot prove his having been a near-terrorist. He asks that this point be taken on faith, given that the rest of his life is as he says it is. I accept his reasoning. Mar. 10, 2008 update: Shoebat challenges a critic at "Put your money where your mouth is." He also cites my endorsement of his biography at "Evidence of My Credentials." Mosab Hassan Yousef's father co-founded Hamas, he converted to Christian and loves Israel. Sep. 13, 2009 update: For another example of a Muslim Palestinian terrorist turning into a pro-Israeli Christian, note Erick Stakelbeck's interview with Tass Saada – or see Saada's own autobiography, Once an Arafat Man. 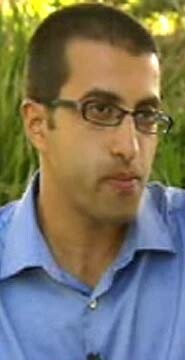 Feb. 25, 2010 update: Mosab Hassan Yousef, 32, is the son of a Hamas leader who spied on Hamas for Israel, converted to Christianity, moved to the United States, and is now presents himself as ardently pro-Zionist. has since revealed himself to be more double agent than turncoat. ... his tale has since been revealed to be a "long con," the evidence coming from when he speaks publicly in Arabic. Mosab did not convert to what the West would recognize as Christianity, but to a fiery, Palestinian brand of the faith that is vehemently anti-Israel. According to Mosab, his main goal in coming to the U.S. is to infiltrate the main source of international support for Israel: the American church. From an interview with Al-Arabiya: "During my tours in universities and even churches, [I found] the real support for Israel stems from the church in the West. ... We need to understand the difference between "revenge" and "resistance" and once the Palestinians do, we will have our victory against Israel." Activists like Mosab know very well that Western media rarely translate their doublespeak. He continues: "Israel is the problem and as an occupation it needs to end. ... There are many ways to do this besides the coward explosive operations." Mosab's formula? Infiltrate the West with his book: "This will be the first time in history that a Palestinian book will find success so that the Western reader can see for himself the reality of what goes on over there. People in the West do not know what happens over there." On the Arabic-language show Daring Question, Mosab wore the symbol of pro-Palestine advocates, the kaffiyeh: "With a balanced approach I discuss the life of the Palestinian child under the Israeli occupation, of course my life suffered under all the problems of murder and the criminal operations that were carried out by the Israeli occupation against my people, my family, myself, and against humanity." Many Jews and Christians in the West are unable to determine friend from foe in the Mideast; they are not able to read what is said in Arabic. They must seek translations, and must be aware of double agents like Mosab. May 5, 2018 update: Walid Shoebat's son Theodore posted something titled "Judaism Is Satanic" at shoebat.com, suggesting that the family has reverted to its historic biases.